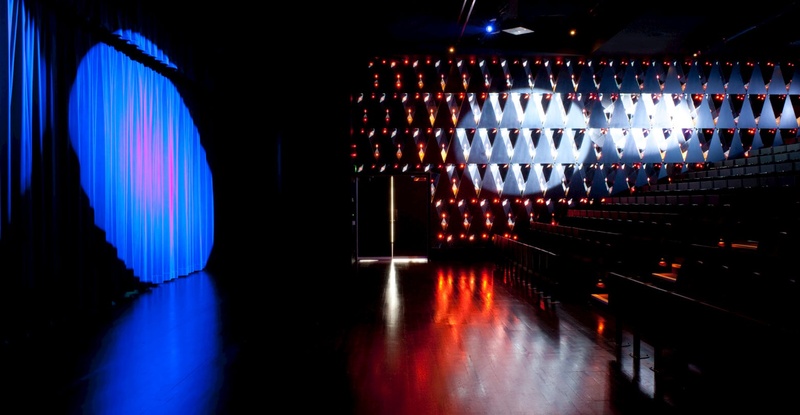 This project allows students to explore the potential of light and sound, and the creation of mood – an essential part of theatrical endeavour. Tierney Hall was a multi-function hall built in the 1970s – an example of late sixties/early seventies rationalism/brutalism. Following the construction of a purpose built sports centre, Tierney Hall fell into disuse and disrepair, and was disliked by many. 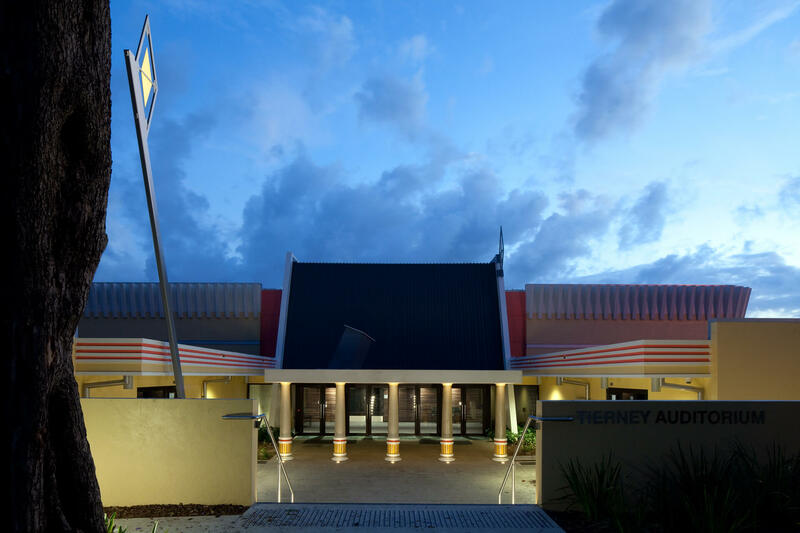 In 2008, we master planned the St Joseph’s Nudgee College campus and proposed a series of refurbishments, including the conversion of the hall into a Theatre and home for the Drama Department. Consistent with the proposed use, the idea emerged that the interior could be designed as a theatrical interpretation of the exterior. This strategy was opportunistic as well as necessary; opportunistic as the bizarre qualities of the existing exterior were celebrated, and necessary on a very limited budget. 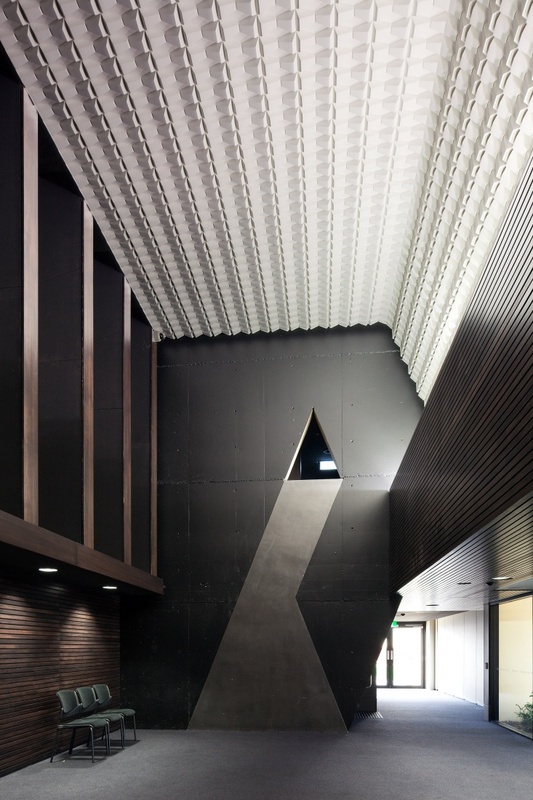 The two facades of the main auditorium are lined with triangulated boxing with acoustical properties. They offer a kaleidoscopic effect, through light and surface treatments, turning single diamonds into starbursts, with optic fiber lighting and phosphorescent surfaces offering a vast range of visual effects. 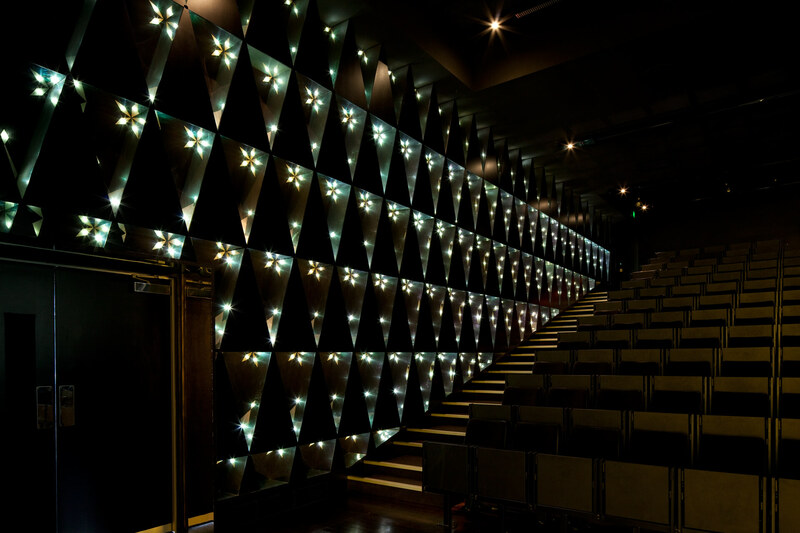 The auditorium can seat 300 in tiered seating with an additional 100 on the flat, and is able to be subdivided by an operable wall. Its flexibility enables it to be used for performances, lectures, assemblies, and it is frequently externally hired.